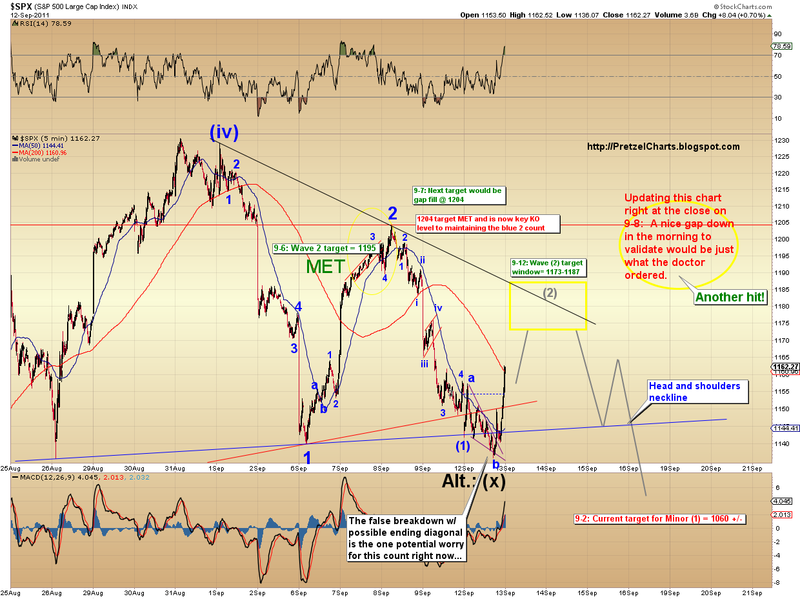 The preferred short term count is still looking golden. I do have a slight concern about the failed breakdown, because this can sometimes generate large moves in the opposite direction -- however, at this time, there's no reason to think that will be the case. 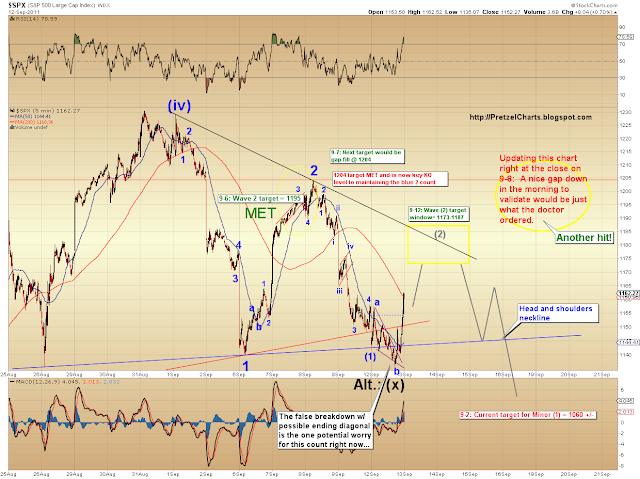 It looks to me like the failed breakdown was the b wave of sub-minuette (2), with c of (2) unfolding now. The target for preferred sub-minuette (2) is 1173-1187, but if the count is correct, the top target range is probably unreachable. If it was reached, that might be cause for concern as it would violate the falling trendline connecting the head with the right shoulder of the now-complete head and shoulders pattern. I have included an alternate possibility that the three prior waves down were a-b-c (not labeled) of an (x) wave. If this alternate count were playing out, we would be on our way to new marginal new highs, probably at the top of the rising trendchannel. Again, there is currently no reason to doubt our preferred count, but I do think it's helpful to be aware of the possibilities as part of an exit strategy, if the preferred count seems to be failing. A break below the recent b wave low will likely confirm that wave 3 is underway. Not much to add beyond that. Trade safe!